Parrothead Radio and Parrothead Music! The phrase “Parrot Head” started in 1985 with a Jimmy Buffett concert in the Timberwolf Amphitheater located at The King’s Island amusement park near the city of Cincinnati OH. 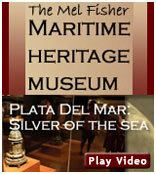 Jimmy Buffett has stated on numerous occasions that he attributes a large part of his fame to this venue. The phrase Parrothead mostly meant that someone is a fan. At the performance, Gwen joked about so many people wearing Hawaiian shirts and parrot hats and that they keep coming back to watch the shows, just like Grateful Dead, Deadheads. Timothy B. Schmit, who was a member of the Coral Reefer Band (now playing with the Eagles), coined the term “Parrot Head” to describe each of those fans. Another musician who was closely associated with Timothy B. Schmit is Paul Cotton, a founding member of the band Poco. Schmit joined Poco in September 1969 along with Jim Meisner who later became a founding member of the Eagles. An interview with the legendary guitarist Paul Cotton can be seen right here on ConchTV! The stereotype of a Parrothead is a person wearing a colorful Hawaiian shirt, flip-flops and cargo shorts, or a grass skirt and a coconut bra all the while drinking a margarita. Many rabid fans are serious members of Parrot head clubs. The general style of a true Parrothead is one of relaxation, even while working! Some folks like the spelling “Parrotthead,” mirroring the double “t” in Buffett. The more “serious” style is to wear expensive tropical resort vacation clothing, however this is likely viewed by many as a departure from the “true beginnings” of being a Parrot head as it references a more expensive lifestyle than is commonly associated with being an island beach bum. Parrot Head Clubs “party with a purpose,” and organize fundraiser events for many different causes. 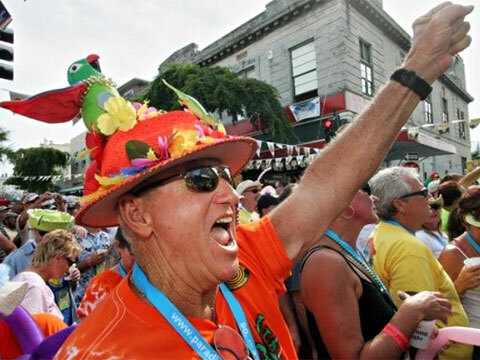 Events range from single act concerts or happy hours to the annual Meeting of the Minds in Key West, Florida, which attracts approximately 3,500 Parrotheads each year. The several day event, sponsored by the Parrot Heads in Paradise includes live music, but also a Toys for Tots drive, a blood drive, raffles and other events to raise money for charities. Some regional groups will focus on one or two key charities, while others may switch between several. Environmental causes, cancer research, Alzheimer’s research and the March of Dimes all have received large donations from Parrothead organizations. In 2005, 2.2 million dollars were raised by these organizations, along with toys, blood, canned goods and many hours of manpower to support various charities in the US and beyond. Tribute Cruises organizes Jimmy Buffett Tribute Cruises sponsored by the Coast of Carolina Parrothead Club to raise money for different charities. A newly formed Key West Radio Station is Conch Republic Radio. This Trop Rock radio station broadcasts non-stop Parrothead music 24-7 over the internet. Along with original Island music, there are dozens of video interviews with famous Trop Rock musicians, many who have played along side Jimmy Buffett. This Key West Radio Station is located right around the corner from the world famous Margaritaville Cafe, where visitors can order a Cheeseburger In Paradise and watch Live Concerts. Conch Republic Radio also features Concert Video Broadcasts on their internet Pirate Radio Station in the heart of The Conch Republic. 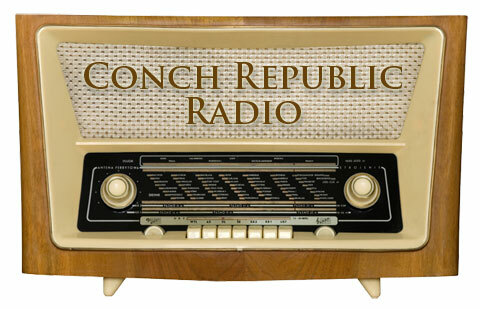 Visit ConchRepublic Radio today to start listening to original Trop Rock music from Key West, Florida!